Not Just Another Mother Blogger! : Mardi Gras Random! It is that time of the year, that day when every single woman can eat as much chocolate as her heart desires. No, not Valentine's Day. The 'other' day. FAT TUESDAY!!!!!! Today, even Zane's Catholic school is having a parade, and he's dressed up in the traditional 'Nawlins' Mardi Gras colors(purple, gold, green, black) I even found him some old beads, so he doesn't have to do any of those *cough* crazy things that people will do for beads. How did I get those beads? *cough* *cough* We'll be moving along now. But today my motto is "Eat, Drink, and be Merry, for tomorrow we diet." We just finished watching the second season of Justified. I love Timothy Olyphant's acting, even though he's played the exact same character in everything he's ever been in. In other words, he's consistent! That's more difficult than it seems in the acting field. Larry and I were excited to get back into The Walking Dead this past Sunday. Things don't seem so bad when you don't have zombies trying to eat your brains, I suppose. We'll be downright giddy when Game of Thrones comes back March 30! This year, for Mardi Gras, I decided that I would have some Kings Cake. What the heck is a Kings Cake, particularly in this great country of ours which does not have a monarchy? A Kings Cake is sometimes also called an Epiphany Cake and served in January. Down here in the Southern bits of the States, they serve Kings Cake during Mardi Gras. It's shaped in a ring, it's often decorated in colors not found in nature, and it's a diabetic coma waiting to happen, if you make it right. 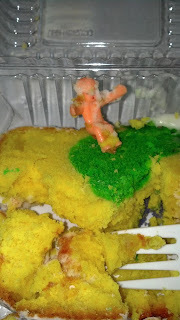 There's also a plastic or ceramic toy inserted into the cake, and if you find it in your slice, well. It's supposed to be good fortune for some, and in other places(like New Braunfels), the person who finds the baby(it's usually a baby, for some reason), is supposed to buy the cake next year. Which is kind of a ripoff, as far as I'm concerned, but I'm willing to play the game if there's cake involved. So I went and got me a slice of Kings Cake, and whaddaya know--? Since I purchased my own slice of cake, I feel no obligation to buy one next year. I am, however, going to enjoy a free meal courtesy of the restaurant where I purchased my slice. That was the prize the restaurant was offering if you found the baby. We are supposed to pre-register a seat for Zane for Kindergarten in the fall. I freaked a bit--my boy will be in KINDERGARTEN??? Then I read the brochure, and freaked a little more: Zane will have to take a test to see if he is ready for kinder. Really? What if he's not? Will they kick him out? That would be embarrassing, to have my kid booted from kindergarten for failing a test. But it's a private school, and they can choose the children they want at their school, and we will just have to deal with it. Of course, doing what I do for a living, I already have a pretty good idea where Zane is in comparison to his peers, but I'm curious about how they plan on testing him, what test they plan on using, etc. I don't want to be too pushy about asking, however. I'm trying really hard not to be that Mom. Head on over to see Stacy at Stacy Uncorked! I come from the days when the only restriction to Kindergarten was your birthdate, when you turned 5. If your kid didn't qualify for public school and you wanted them to start, you put them in Catholic school. With the girls we went the public school route, but there were more alternatives. Now I think I would find a way to pay for private school or Charter school. Look at you getting lucky with your slice of King's Cake! Way too cool! I still have a few Justified's left. One of my favorite shows. Timothy is super fine. But was the cake yummy!? Oh yes, the cake was sooooo yummy. I needed a nap after all that sugar! I was supposed to run with a pancake in a skillet today but the race was cancelled because of the blizzard effects. :( Had I known about the cake custom, I would have raced for that!